Vienna, Austria, May 29th 2018 - The President of Azad Jammu and Kashmir H. E. Sardar Masood Khan said that the China-Pakistan Economic Corridor is the flagship project and an offshoot of the Belt and Road Initiative, thereby any role Pakistan can or will play between Europe and China will be within the framework of the Belt and Road Initiative (BRI) and China-Pakistan Economic Corridor (CPEC) combined. 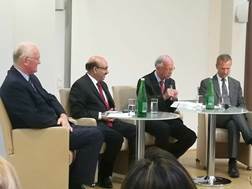 The President made these remarks while addressing a seminar titled "Pakistan's New Role Between China and Europe; Opportunities and Challenges of China's Silk Road Project" organized by the Austrian Institute for European and Security Policy (AIES) in Vienna, Austria, which was hosted by Dr. Werner Fasslabend, Former Defense Minister and President of AIES. 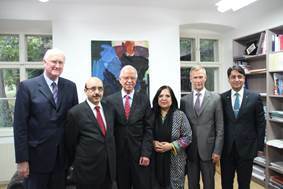 The event was co-hosted by Austria National Defence Academy and the Universal Peace Federation who were represented there by Brigadier Walter Feichtinger and Mr. Peter Haider respectively. 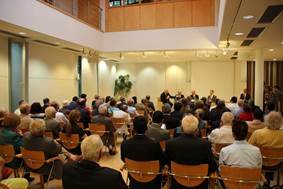 It was attended by over 70 scholars, analysts, ambassadors, diplomats, UN representatives and members of civil society. Dr. Werner Fasslabend said that Pakistan is young and dynamic, and it would be among the top economies of the world by 2050; and now that it is the hub of the China-Pakistan Economic Corridor (CPEC), Pakistan is a conduit and a destination for logistical chains, trade and investments. Explaining the scope of the Belt and Road Initiative (BRI), the President said that this is an unprecedented transcontinental project spanning Asia, Europe and Africa aiming for global connectivity and economic prosperity. With massive potential, he said, this initiative covers 68 countries with plans to invest over US $ 1 trillion in infrastructure, energy, and industrial projects. Underlining the importance of the European Union, President Masood Khan said that the EU's market of 460 million people, as well as the EU's treasure trove of technology and know how, makes it imperative that modern connectivity channels are established. He said that investments in Europe by China in energy, telecommunication, real estate sector and similarly Europe's investment in industrial and services sectors in China have created mutual dependencies. He asserted that both the BRI and CPEC are a conscious effort to reach out to Europe which will bring Europe closer to Chinese markets. CPEC is not just a stand-alone project, he added. It is developed into a network for connecting East Asia, South Asia, Central, West, and Southwest Asia. He added that now many regional and extra-regional states are showing interest in it and has already attracted the attention of Russia, Turkey, Italy, France and the UK and several other European countries are already consulting with Pakistan and China to participate in CPEC projects. The Gwadar Port, in particular, he said, will give Russia access to warm waters via Central Asia for international trade, helping begin a new phase of cooperation between Russia and Pakistan. President Masood Khan said that concerted joint investments by Europe, Pakistan and China under the umbrella of CPEC would create huge opportunities for livelihoods, businesses and human development. In this context, he added, it will build bridges between Europe and China, Europe and Asia, he said, adding that Pakistan will play a pivotal part in this process. While responding to the questions presented by the participants, the President said that he CPEC would continue to be implemented despite the changes in the governments in Pakistan. "There would be continuity in CPEC related projects, which would be completed without interruption, adding that Pakistan is now looking at the region geo-economically, not geo-strategically" he added. The audience took a keen interest in the possible resolution of the Jammu and Kashmir dispute. The President said that the Jammu and Kashmir issue should be resolved in accordance with the mechanisms established by the United Nations for the pacific settlement of disputes, which included dialogue, preventive diplomacy, peacemaking, negotiations and mediation. The President said the use of force or state terrorism will not resolve this issue. He expressed the confidence that one day the voice of the Kashmiris will be heard and their legitimate right for determining their political future will be recognized by the international community. President Masood Khan said that Azad Kashmir promotes and protects human rights and he strongly urged the international community to intercede to put an end to human rights crisis in Indian Occupied Kashmir. The President said Azad Jammu and Kashmir, is now also integrated into the China-Pakistan Economic Corridor and four projects under CPEC have been initiated. These are two hydropower projects, one of them being directly funded by the Silk Road Fund, one expressway and an industrial zone. He added that Azad Kashmir was a peaceful territory, with the lowest crime rate and highest educational score in Pakistan.